"did you make a snowman?" 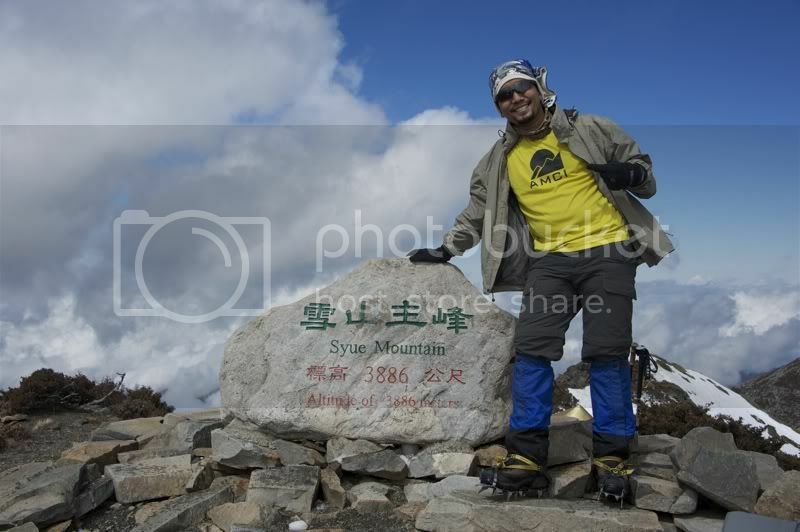 asked the malaysian we met at the 369 hut after we declared our successful ascent to the summit of xueshan. i struggled for an appropriate reply as to why we didn't. after all, this is what every person from the tropics is expected to do when he first encounters snow: source twigs, a carrot, some buttons, and a bowler hat, roll ice into balls and make a likeness of himself as an overweight white man. "a friend of mine made a snowbunny," i replied, and he seemed stunned we hadn't acted appropriately, surrounded by all that snow. "and snow angels." still, this did not satisfy him, and the look on his face seemed to ask: why? "the snow was just too cold," i finally said. "we couldn't hold snow for too long." 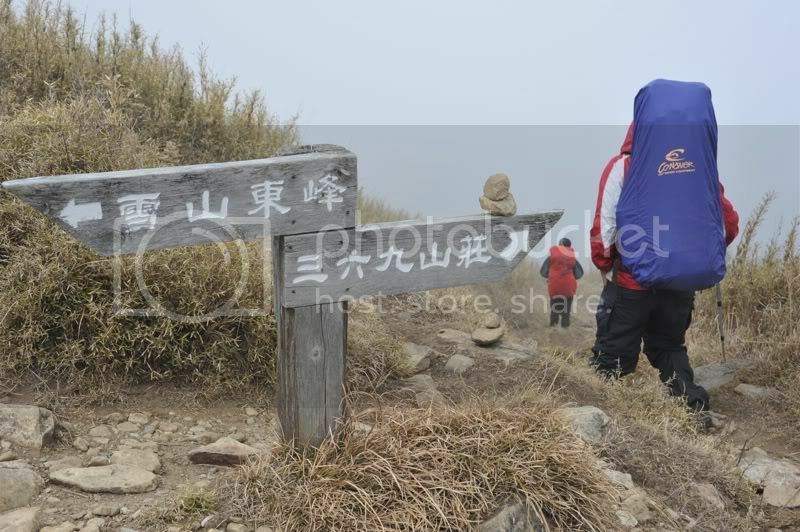 in fact, we were cold far too early in the climb, beginning the moment we stepped out of our bus at the trailhead in wuling farm, when we wrapped ourselves in jackets, gloves, scarves, and bonnets. nine hours earlier, we were whisked from downtown taipei, and traveled through tunnels drilled inside mountains and highways carved from mountainsides to reach shei-pa national park. getting there was an atrocious test of patience. there were long periods when our bus parked itself on the road, as parts of the mountain pass could only be accessed by one car at a time. our ordeal was made worse by the fact that wuling was blooming with the colors of early spring, and the locals were driving into shei-pa in droves. so at around 6:30PM, our guides were distributing packets of food, and after having stuffed sleeping bags, crampons, and layers of clothes i hoped would make me feel warm and fuzzy during the wintry evenings, i heaved my 70 liter osprey argon on my back. it towered over my head like a tall, burdensome shadow. 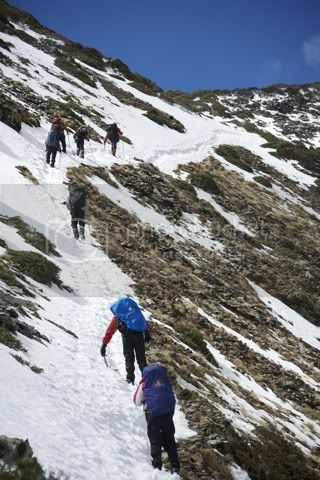 we began our trek up into the darkness in relative silence, as if the air froze our words. after 15 minutes, we began peeling off the layers we had piled on: it only gets really cold when you hold still, but under that weight and up the trail, you perspire as you do when it's 15 degrees warmer. in about an hour and a half, we all reached cika hut, which is about 2 kilometers from the jump off and sits at an already high 2463 meters. the hut has two rooms each with two rows of barracks-style double bunk beds, which, on peak seasons, can sleep as many as 156. but on that evening, there were only us, our guides, and two other taiwanese climbers, allowing us ample elbow room to roll around -- after all, there was not much to do in the evening. 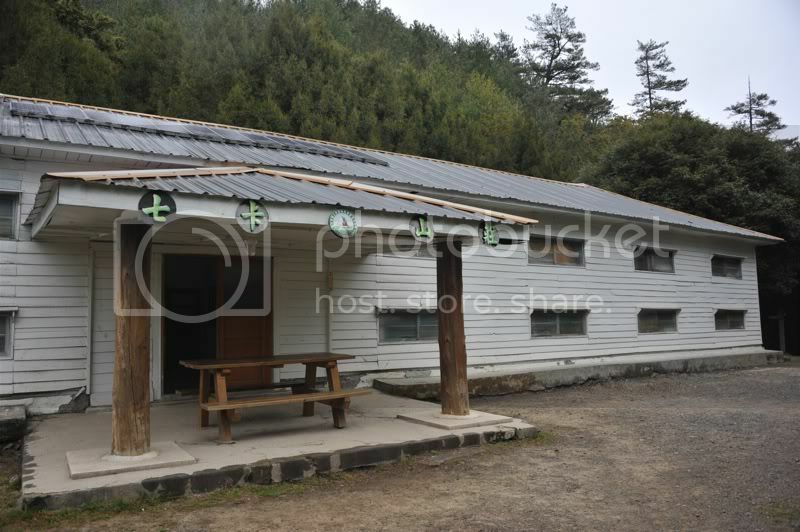 cika hut was well equipped: there was running water, toilets, solar-powered lights, and a huge mess hall where the guides tended to dinner. that evening, we were served a huge pot of soup with an assortment of vegetables which we did not manage to finish. instead of throwing away the leftovers, the guide ate every morsel. i am not sure if that incident convinced him of the size of our appetites, but on some days, we were either weak or grouchy for not having eaten too well. ahead of our trip to taiwan, we had informed the guide of the dietary restrictions of some of the team members: niel is a vegetarian and danna does not eat pork. probably to make things easier for them, the guides did away with meat altogether, leaving the carnivores amongst us trembling from deprivation. the scale of the logistics in getting to snow mountain was unfortunately lost on me. a few months previous, niel asked me whether i was interested in climbing the second highest mountain in taiwan, and i immediately said yes, not certain whether i would be in shape, or whether i would have the resources to fund what then seemed like a simple plan. i was not too concerned about getting myself prepared until after a week before we left for taipei, and i read a blog entry on a failed attempt at reaching the summit. i was suddenly gripped by the fear of failure and concern brought about by ignorance, more than anything else. i was unsure about what i was getting myself into, and i never even realized that so much had to be poured into the preparations: permits had to be secured, payments had to be made, and many emails had to be exchanged with the guides who spoke primarily mandarin. it was comforting to know, at the very least, that we were taking the east xue trail, the mountain's executive route, if you will. it was not only the shortest way to reach the main peak, but is furnished with the facilities that robbed us a bit of the wild in exchange for a little of the comfort. the following day, we began our hike at a little past 8AM. the previous evening, jack had described what we were supposed to expect. 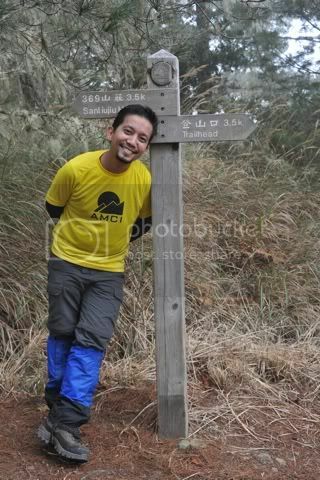 his english was limited, but we got the general idea: 3 kilometers going up. 1 kilometer flat. 1 kilometer going down. in terms of altitude, that meant a 750 meter gain for the first 3 kilometers, then a loss of about a hundred in the last. but it's actually a little more complicated than that. 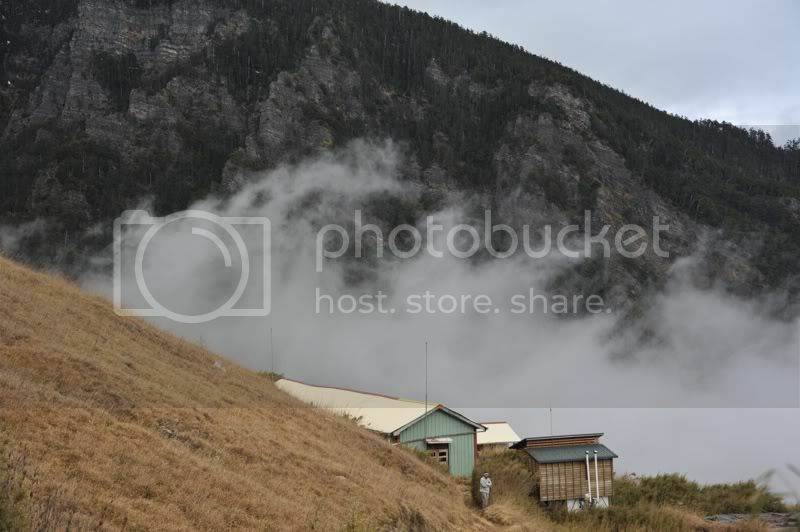 outside cika hut, the thick fog of the early morning could not conceal what the previous evening hid from us. the trail continued to wind up the mountain in a dizzying zigzag through the lush pine forest, whose trail was browned by needles. in places, weather-beaten logs had been driven into the ground both to serve as steps and also to prevent erosion. wooden markers spaced 100 meters apart recite how far away the destination is and how much distance you've covered. there are also rest areas where information about the mountain's landscape, geology, and wildlife is displayed. unpainted picket fences were also installed to prevent climbers from drifting off the main path. 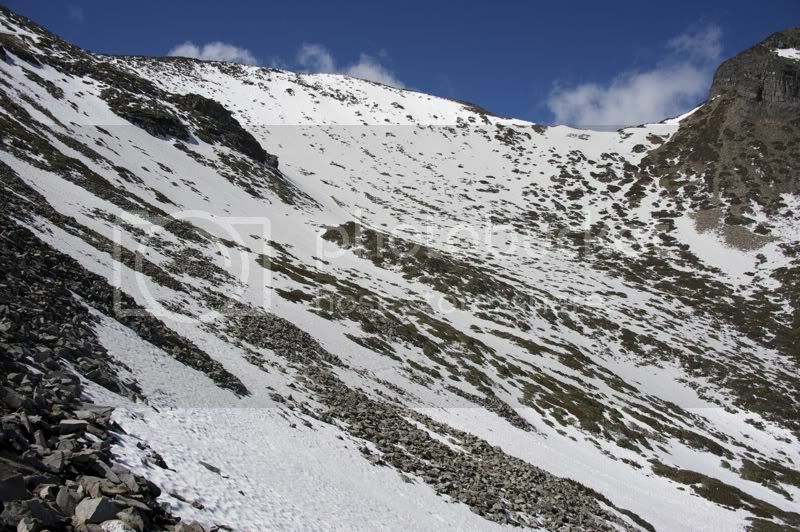 when we reached the foot of the crying slope, we noticed the subtle changes in the surrounding terrain. the erect pine trees dispersed, the trail became littered with rocks, and foliage shrank into bushes. oaks and junipers began to appear, even as we crawled towards the east peak, pausing every few steps, amusing ourselves with stories that had little to do with our present burdens. 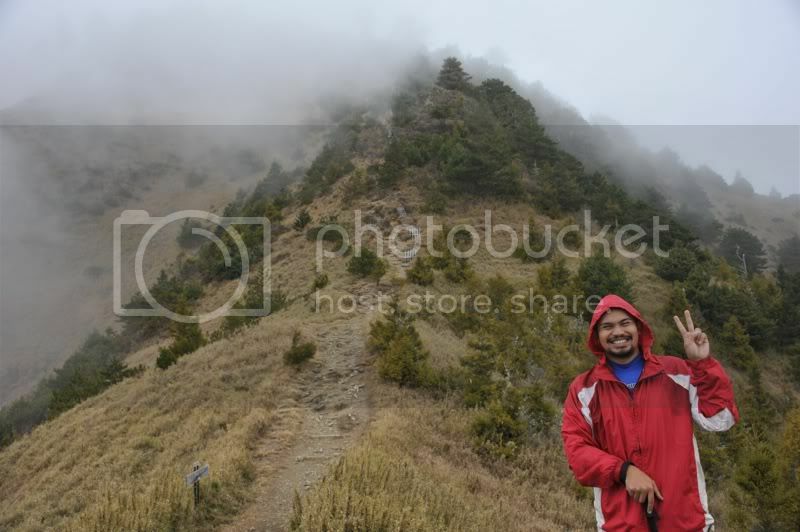 along the way, we encountered mountaineers who were descending to wuling farm. many of them were pleased to find out we weren't local, and perhaps even surprised to realize that we had come from a country where the word alpine is associated with a brand of evaporated milk, or that the closest we'd come to seeing snow is by scraping the ice inside our freezers. the crying slope was terribly steep, and it left me breathing more vigorously than i'm used to, inhaling what little oxygen i imagined might be availble at 3000 meters. finally, i found jack sitting on a rock, talking to two climbers, one of whom was wearing socks over his vibrams. his funky-colored plastic snow boots were hanging from his huge bag. there was a a directional sign behind jack, pointing to where we were headed and where we were just the previous day. "east peak." jack said, pointing to a mound of earth on his right. it was so far the most reassuring two words i had heard that day, since it suggested that there would be no punishing ascents until we reach 369 hut. we spent a brief moment at the east peak, wondering what lay beyond the fog, and decided that we should go on even though jack was inclined to stay and wait for the others. he told us to just "go straight, follow the trail", which is more or less what we did. a few meters from the east peak was a giant white H, at which point i complained about why there were brief uphill stretches when we were promised a very steady trail to the next hut. then i realized that it had just been after lunch, and i had nothing but crackers. one of the things that i belatedly realized was that we weren't stopping for lunch. it wasn't even on the meal plan. we were told that we should just stock on bread to munch on along the trail, but it was not something i was about to get used to, and i was grumpy. i was admiring the interesting flora that grew around us and imagined how they must look like in autumn. the late winter and the onset of spring had allowed the trees to be either green with life, or bald and pale from the frost. many of them were wrapped in green moss, which spun around trunks and branches like yarn. throughout most of the last part of this day's trek, we were focused on the trail. there was nothing to see outside of 20 meters, and our visual radius was further obscured the nearer we got to 369 hut, that we didn't realize it was already in front of us until we were 5 steps away from it. we were under the impression that all the other climbers had gone down, so we announced our victorious arrival to the world, only to realize that there were 3 other persons in the hut. we bowed to show our courtesy, and spread our things on the areas that had not yet been occupied. i am not sure how far away the rest of the team was from us but we had dozed off when they arrived, although it wasn't even past 2PM yet. in the other room, the only other climbers at the hut were fixing their things. i noticed they had packed climbing rope and each one of them had a harness. this stoked my fear and i wondered whether we were ill-equipped, despite the last-minute shopping frenzy that sent us buying gear that would have no use in the more temperate region where i usually climb. after a while, jack decided to make soup to warm our bodies. although we had climbed in elevation, perched at 3100 meters, the outside temperature was still at a tolerable 8 degrees. 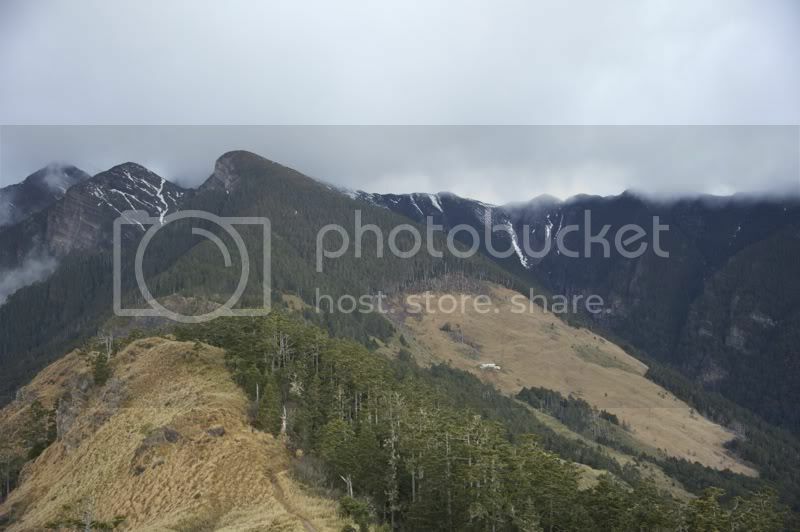 outside cika hut, the fog was spinning in imperfect circles over the vast expanse that opened between two ridges that disappeared in the bouquet of clouds in the distance. 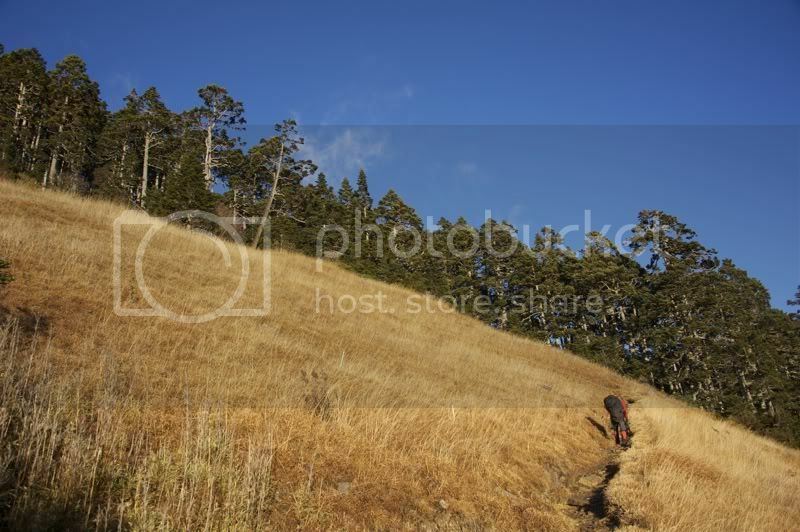 cika hut sits on a slope cleared of trees and populated only by dwarf bamboo. it also has many of the facilities that are available in cika, except that it has the strangest toilet. while comparatively more modern than the holes in the ground that we are accustomed to, the dry toilet is equipped with a system that "flushes" without the need of water. you crank a wheel any direction, and a churning mechanism scatters whatever that falls into the catchment below. unfortunately, not everyone does his business with precision, and the toilet is disgusting. after CY arrived close to sunset, dinner was served. the mess hall was abuzz with activity, and we feigned excitement over the food that left us regretting the surrender of our meals to the discretion of our guides. we were served boiled noodles and pickled vegetables whose flavors were so subtle that my advice to anyone climbing snow mountain in the future is to bring patis. the weather improved a little that evening, and the sky cleared to reveal the attendance of many stars. the faint moonlight traced the outline of distant peaks. since we were all anxious about what was to take place the following day, we all decided to sleep early. 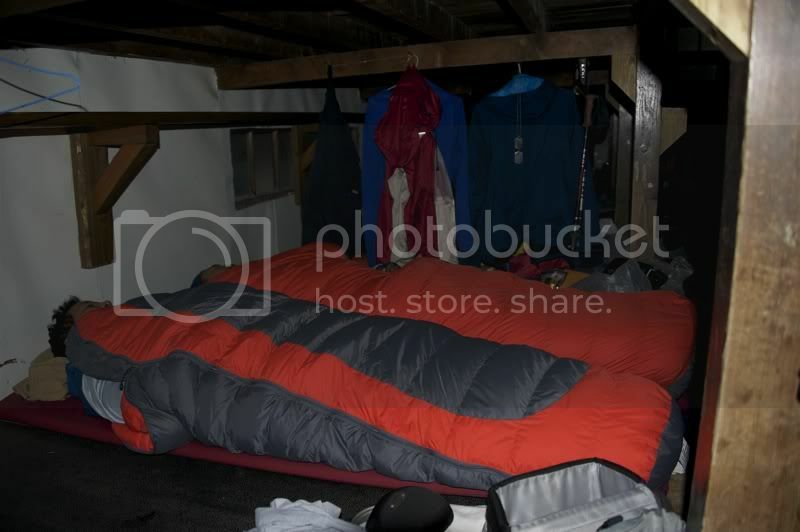 it wasn't even after 7PM when i cocooned myself in my negative-rated sleeping bag which was rented from the guide. we were also provided a hygienic liner -- who knows how many climbers have slept in these -- and filled the lower deck of the bunk beds with colorful, fluffy pods. the strange bedtime had us waking at very odd hours. it could have been the excitement, really, or the deranged mountain rat that kept running over our heads. at 5AM we silently rose from our cozy bunks to hug the frigid dawn. the guides refused help in the kitchen, although it doesn't take a lot to boil a tasteless congee and open a pack of mantao bread. a while later, jack gave us a final briefing: one kilometer to the forest. one kilometer in the forest. 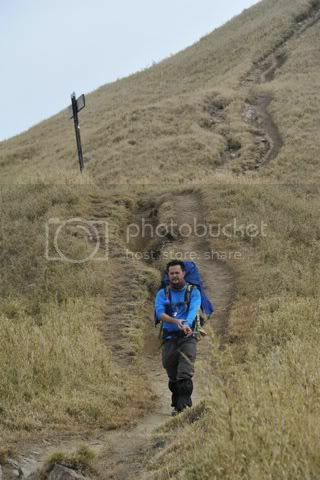 one kilometer to the peak. the sun had just risen when we started to trek, bleeding the golden colors of dawn onto the vast mountainscape that surrounded us. our shadows were long against the slope, and although we moved slowly, it was as if the world around us had changed the minute we stepped into the black forest, which was nestled in the sombre shade of a high ridge. the erect, gray trunks of pine trees jostled for sun in the canopy, and the narrow trail meandered along a precarious slope. it was here where we finally encountered snow, first in pockets, in patches, then in sheets, until it seemed that the entire forest sprang out from this white bed of ice. 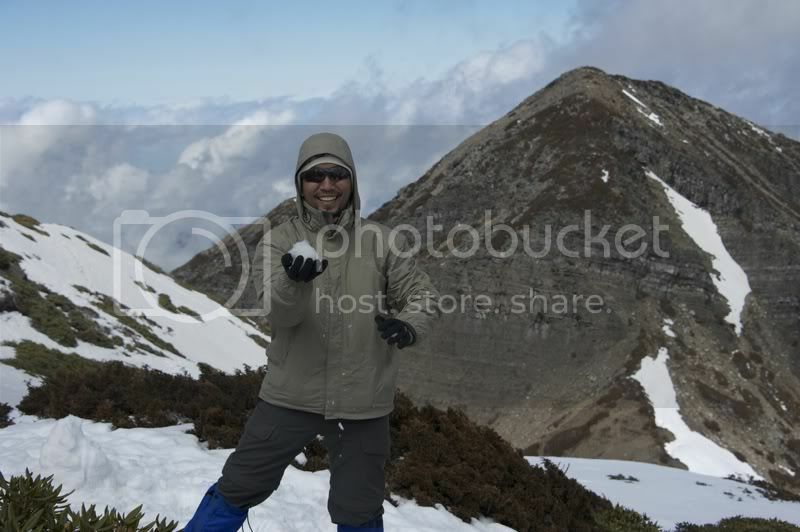 i have been somewhere higher, but xueshan's altitude and distance from the equator allowed it a cover of snow during winter. there was a tinge of disappointment in my heart when i realized that snow on the mountain was not nearly as immaculate as it was in my imagination: the wind had speckled the white sheets with dried pine needles. perhaps we had come not at the best time to experience alpine conditions. winter was already waning in the last week of february, and we caught only dregs of the abundant snowfall that took place in the previous weeks. giant icicles that resembled cold stalactites were melting on a boulder, and in parts the snow had been compacted to shiny rocks of ice. 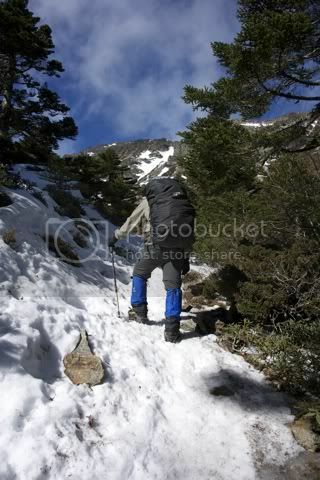 there was a section of the trail that was described as a rock waterfall, where a sheet of solid rock seemed to have broken into many pieces, allowing the snow to settle inside the cracks. 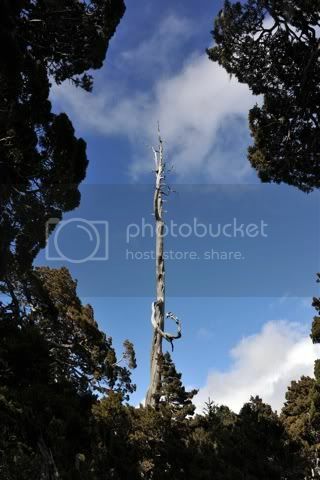 at a rest area, jack pointed to a tree whose trunk had been scraped. black bear, he said, and although it was likely the animal was in hibernation, i had to ask whether there had been any record of attacks on humans. somewhere inside the forest jack decided that it was time for us to wear our crampons. ahead of this trip we knew our hike through snow-covered mountain trails would not have been complete if we weren't sufficiently equipped. in taipei during our final briefing, our guides distributed the tools that would make our climb both safe and possible, including a pouch that contained two metal contraptions with long yellow straps, each resembling the jaw of a mechanical crocodile. someone pestered jack about putting it on, but he just waved his hand and said later. a minute after, i asked whether i had attached the crampons correctly, and he blurted out: wow, you're very smart! that is right. jack merely mentioned what was obvious, but of course everyone disagreed. "you should not have said that," CY cried. "now we will never hear the end of it," complained another. in fact they didn't. 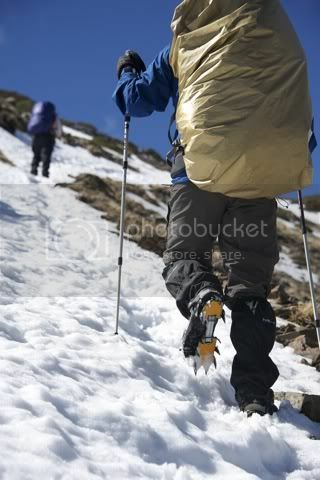 the crampons added at least an inch to my height, and i drove the ten sharp spikes into the snow with so much force, i would probably have pierced my recently-acquired boots if i had carelessly stepped on my foot. we ploughed through the trail with metal teeth under our soles, and finally reached the fringes of the black forest, where the trees, stripped of their green crowns, began to twist into disfigured arms reaching out from the earth's layer of ice. sunlight fell through the gaps on the canopy, and the trail opened into xueshan's glacial cirque. it felt like i stood at the bottom of an open coliseum, with bleachers of snow and rock spreading outward ending abruptly just under a mound that tipped the difficult route known as the holy ridge. dotted lines which the guide said were footsteps of mountain goats streaked from the peak into the meadow where i stood. our trail rose steadily towards the mountain's rim, ending at the summit, which at the time did not seem like the highest peak. we walked slowly to our destination along a trail that was sometimes too precarious. we need only stray a few steps from the path to find our foot sinking into the frosty foam, or fall briefly out of balance and find ourselves tumbling back to the meadow. the sky was blue under my polarized sunglasses, and the clouds overhead moved faster than my lazy pace. i inhaled gulps of air in my paranoid belief that there was little oxygen to go around at that altitude, clearly a symptom of my state of deprived intelligence, having carried the weight of the sky on my head in such harsh conditions. i say harsh because although we were treading on snow, covered in layers of technical fabrics, we had climbed closer to the sun and the fluids swimming inside our bodies had all but turned to steam. the hour that was necessary to reach the peak seemed like a fleeting instant when i finally stood on an area with neither snow nor bush. 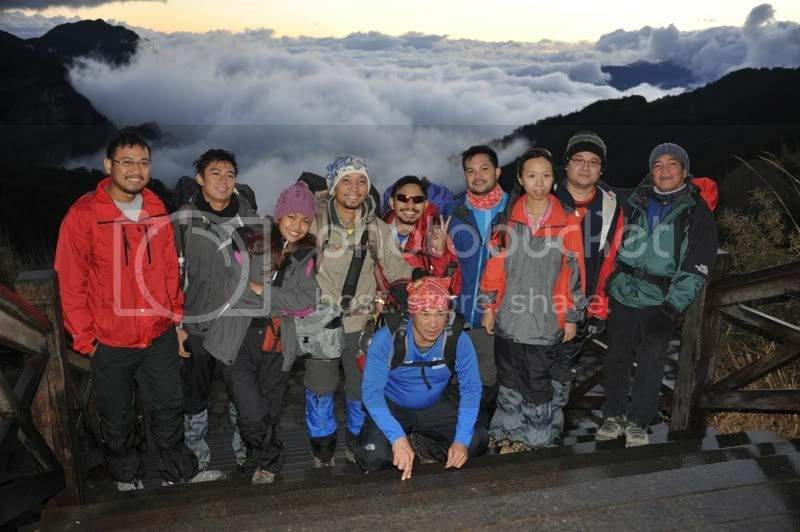 a salmon-colored boulder sat on a platform of broken rocks proclaimed our altitude: 3886 meters. 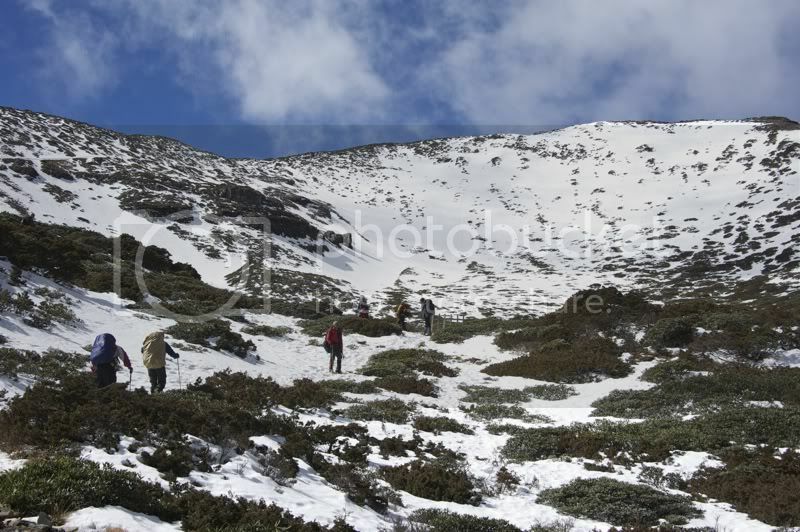 a sign pointed to the other trails in xueshan, including the treacherous holy ridge, which jack said he would never do again in winter. we passed around a bottle of chivas regal which mannie carried all the way from manila, and celebrated our successful ascent to the second highest peak in taiwan, and all of east asia. standing on the highest peak, the summit ridge formed the bottom half of a circle, from which curtains of snow draped towards the meadow. further in the distance, a green forest was hedged between ridges, disappearing under a plume of cloud that seemed to have just escaped a recently-erupted volcano. on the other side, the fog obscured the view of the rest of shei-pa national park. i only had a shot of chivas regal, but before our half hour stay at the summit was over, i already started to complain about a headache. our brains were still apparently not used to the thin air up there, aggravated perhaps by my hunger. jack suggested that we begin our descent as bad weather was brewing. we marched back down to the bottom of the cirque and into the black forest. the way back showed just how steep the trail was. 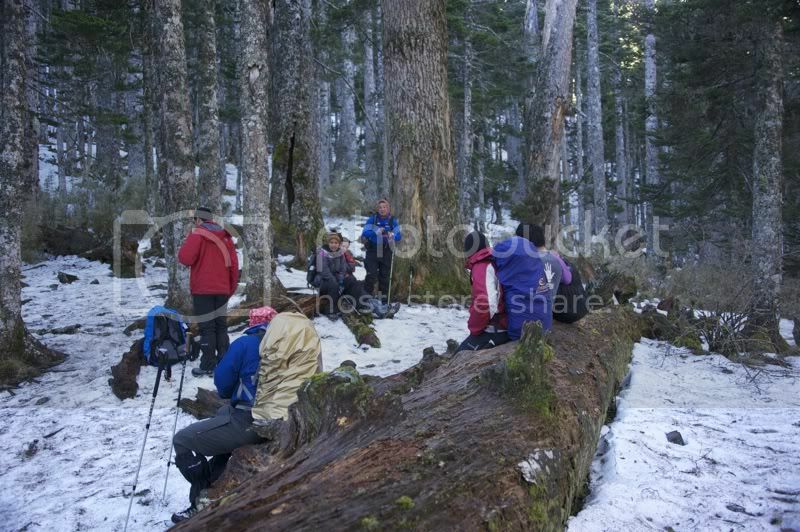 inside the forest, we held on to wearing the crampons until the snow completely vanished from the trail. we were unsure when we would be needing them again. suddenly the forest opened, and we were back inside the 369 hut, wondering what we would do with the many hours left before the day was over. i began to pack my bag in preparation for the following day's descent, but not before finishing the chivas regal to celebrate our safe and successful climb. the following day, xueshan blessed us with clear weather, and although we managed to see her completely, we passed her in haste, possibly because many of us were both trembling and salivating from having been denied meat for so many days. the forest of junipers, oaks, and pine was greener, and the narrow trails appeared closer to the edge; the fog that covered the mountain in mystery also masked her dangerous but graceful beauty. distant peaks were revealed, and ridges rose to the sky. the trail snaked down along a sometimes rocky spine of earth. we rummaged through our bags for something to eat while resting at cika hut, where jack delivered to us some bad news: we'd have to walk an additional 6 kilometers since the bus couldn't get into wuling farm. so although we were early, we decided to continue walking. jack wasn't very accurate, because from the nicely-appointed ranger station at the trailhead to the parking lot at the tourism office, the distance must have been nearly 10 kilometers. the road going there was quite interesting. shei-pa had plantations of very pink cherry blossoms in full bloom lining its narrow avenues, and tourists had swarmed the park bringing along cameras, picnic baskets, and wearing leather jackets with furry hoods. at a bridge, people were staring into the stream, pointing at some of the last remaining land-locked salmon in the world. at one point, the wind blew the petals of a cherry blossom tree, giving us a sample of what i'd read was a sakura storm. it would have been a leisurely stroll had it not been for our heavy backpacks and our aching feet. 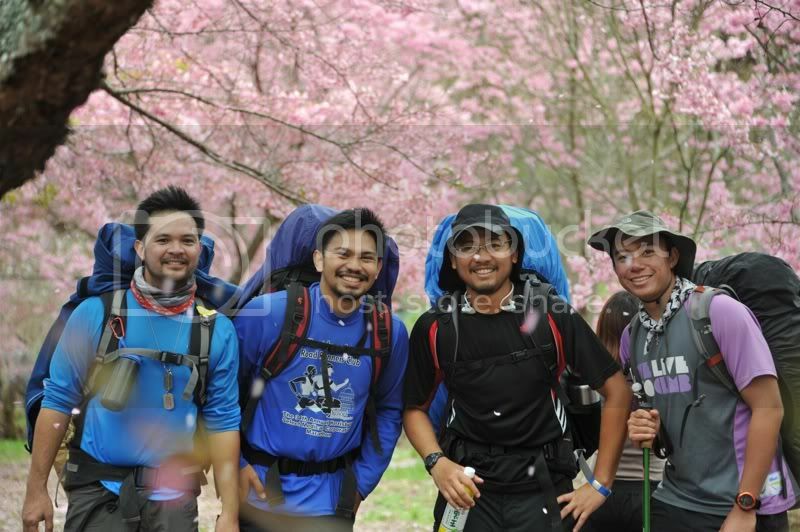 i was a little pissed to realize, about two hours later, that the other members of our team were already at the parking lot, having chanced upon a cab, but didn't offer to unburden us of our packs when they passed us along the road. it took a while for me to simmer down -- if only i had packed some snow to cool my head. climbing xueshan is special not only because i managed to walk on snow; it wasn't unique just because i managed to put on a pair of crampons and pose with an ice axe as though it was an essential part of my gear. lately, i have been a helpless witness to how fleeting most people's passions are. their devotions are ephemeral, and although they began as me, quickly they tire of the usual sensations that accompany an excursion to the mountains. while i have not had to resist questioning my own choice of adventure, i must admit that i have not recently been so excited, or scared, or both, about a climb. the last i felt this was when i first tackled mount mantalingahan, and not since. when something you love dearly starts to become routine, then that should be cause for genuine concern. so there is always something cathartic about plunging into the unfamiliar, the unknown. while it is interesting to see just how different the conditions are elsewhere in the world and to compare my "hills" with foreign mountains, new experiences such as snow mountain have happily confirmed that at the very least, i have not lost a sliver of my curiosity. i want to climb there too! please give us an idea re: budget and itinerary. by the way, your coffee table book is long overdue. for sure, it'll be an instant hit! trust me! thank you very much. 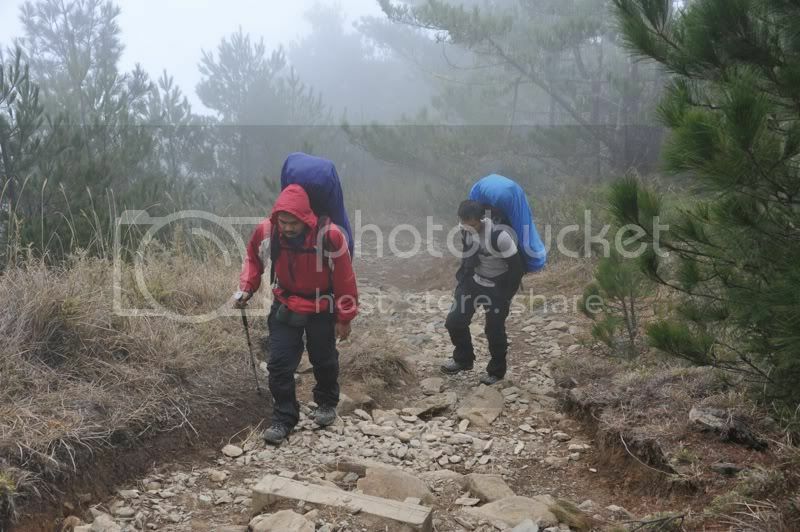 the climb to snow mountain, by itself, is just less than PHP 15 000. this already includes the fees for the guides, the bus, the permits, and the rent of some equipment we didn't have: crampons, ice axes, sleeping bags, etc. it doesn't include airfare and the extra nights we spent in taiwan. if you need a guide let me know so i can refer you to ours. 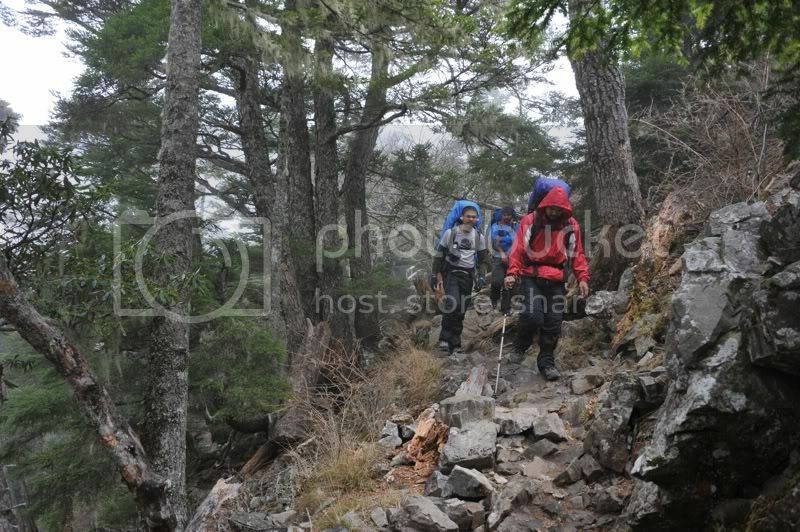 we are actually looking for a guide for our group of 2 people to climb xueshan in December. Could you recommend one? Thanks! 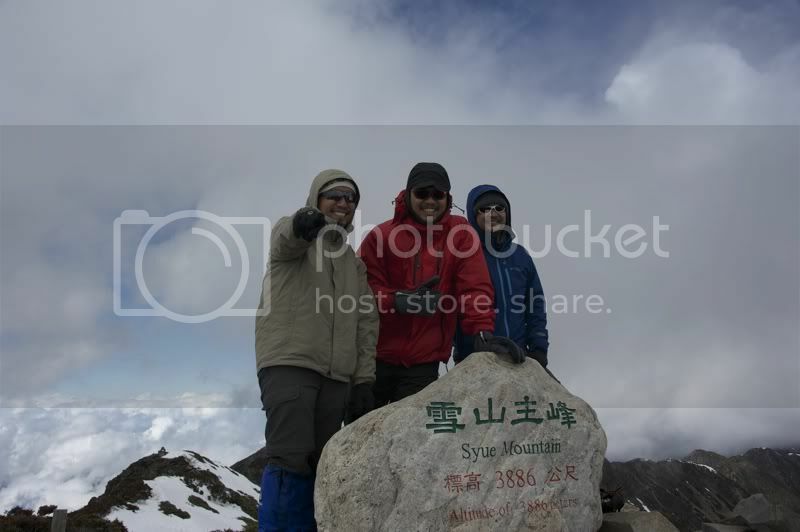 Hello, my friend and I are really interested in climbing xueshan this December. Could you recommend a guide? Thanks! jack did all the cooking. english is limited but we understood each other well. good luck! Thanks Ialman. Just in case he doesn't reply, we are actually considering doing the hike ourselves. Do you think that would be advisable? I've read that the Black Forest can be pretty dangerous but we would do it in full sunlight if we were going alone. What do you think? the black forest could be dangerous if you don't take the necessary precautions. i've read a few blogs where people did the hike on their own, although in the glacial cirque, it could be very tricky because the trail is not marked. it might also even be perilous during really thick snow. also, there's the issue about the permits. you'd need an extra day processing those permits to climb xueshan. but good luck. it will be fun.